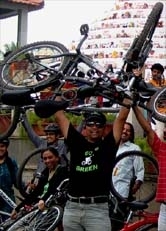 GoGreen Partnering Vodafone's Cycling Marathon 9Feb2014 - GGI-Group size: 4000+ Professionals, Increasing on day to day basis, Come & join us 2 serve Mother Nature. 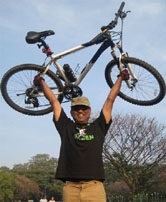 Welcome to GoGreen's Vodafone Cycling Marathon Event registration page. GoGreen is partnering this event & we feel proud to announce this. The first 200 members who register would get Sponsored registration their after Rs. 400 will be charged per registration. Flagging off on 9 February, 2014, the first ever Vodafone Cycling Marathon will bring thousands of cycling enthusiasts from across India to the heart of Bangalore. 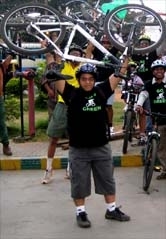 As a GoGreen Group we all are participating in "Green Ride which is specifically made for people like us..
- Bring the spirit of Bangaluru onto the streets and swalpa pedal maadi for a cleaner and greener environment. Below is the list of participants who registered with sponsored entry.. If you are not part of this list then you need to register by paying Rs.400/- This is you do it online or any vodafone stores or @ kanteerva stadium 6,7,8 of Feb during Bib distribution. An update on Vodafone Bib Collection Read the entire information.. Please check the below list and write down your registration form No. & quote this No while you go to collect your BIB. Please note : you need to carry 1 passport size photograph & an photo identity card ,every participant need to be physically present to collect their BIB & Goodies you can not represent any of your friends to collect your BibNo.